The rolling 24-hour news Speculatron was fired up this morning, and an unholy alliance was formed to declare that Young Dave’s jolly good ultimatum to those pesky broadcasters would cause a split, and that ITV would go it alone, hosting that single seven-way leaders’ debate before the election campaign got into its stride at the end of the month. This was a high risk strategy - because there was no evidence to back it up. 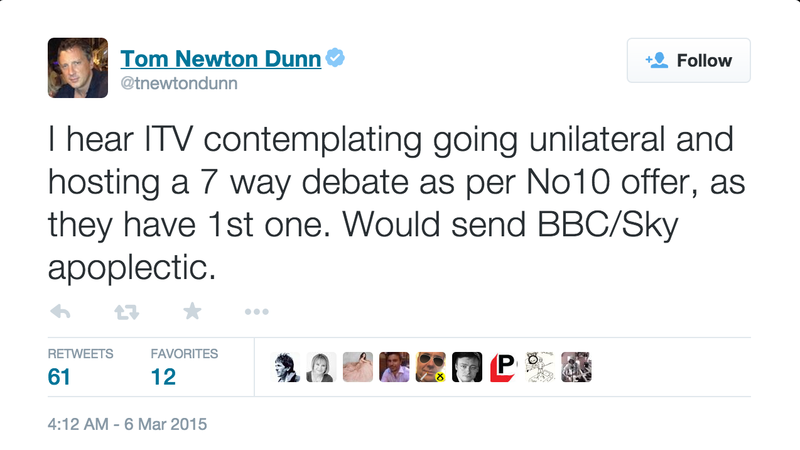 The Sun’s non-bullying political editor Tom Newton Dunn was first out of the trap, declaring “I hear ITV contemplating going unilateral and hosting a 7 way debate as per No10 offer, as they have 1st one. Would send BBC/Sky apoplectic”. The wriggle room in that wording was soon put to the test, as Newton Dunn was challenged by Michael Crick. “1. I said contemplating not planning, 2. No story written, 3. Of course they'd deny it, 4. Of course you want to rubbish it” scoffed the Sun man. 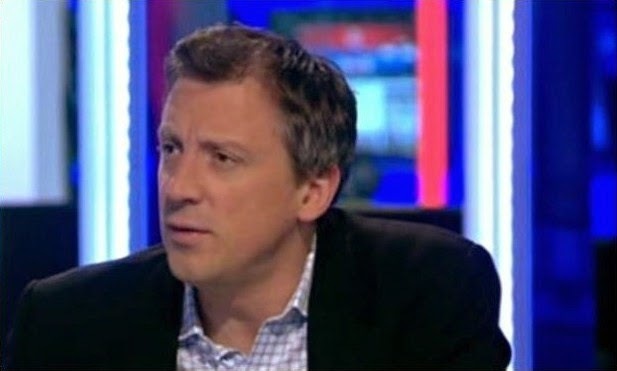 That Crick, of Channel 4 News, someone who knows his way around politics, was sceptical should have caused some of those of lesser experience to stop and think. But the perpetually thirsty Paul Staines and his rabble at the Guido Fawkes blog are not inclined to do either. “ITV Holding A Secret ‘Leaders’ Debate Next Friday” trumpeted the Fawkes folks, with readers only later finding out “Today’s rumours that ITV could be set to go rogue in the election debates will be given extra credence by news that the broadcaster has their debate studio ready to go and will be hosting a ‘shadow’ debate next Friday”. That means the broadcaster is having a rehearsal, nothing more. 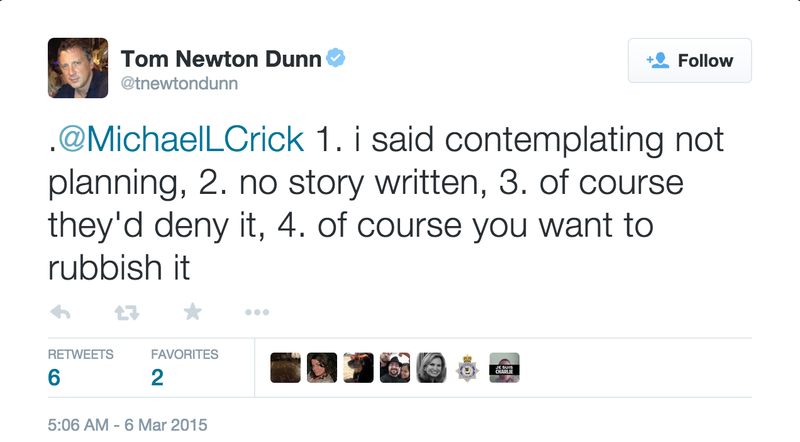 The Fawkes rabble then enthusiastically quoted Newton Dunn’s first Tweet, and for some reason best known to Themselves Personally Now managed to miss Crick’s scepticism and, indeed, the Sun man stressing that his information was that ITV was “contemplating not planning”. 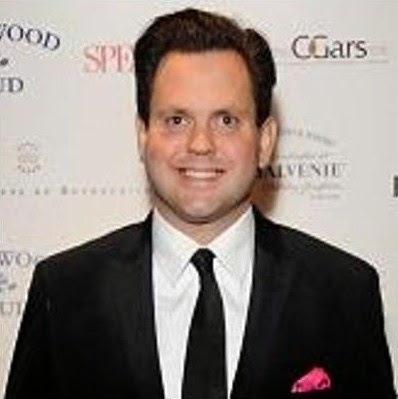 The Great Guido had demonstrated that the Fawkes blog was “#1”. However, and here we encounter a significantly sized however, there was no split in the ranks of the broadcasters, and this afternoon came the news that “Broadcasters have welcomed David Cameron’s offer to take part in a single election TV debate but stood by their plan to hold three separate debates … The BBC, ITV, Channel 4 and Sky stuck by their revised plans to hold three debates, two between seven party leaders, and one a proposed head-to-head between the prime minister and Ed Miliband”. That means Newton Dunn called it wrong, and that, by following his lead, the Fawkes blog did likewise. The broadcasters are inching closer to the “Tub Of Lard” scenario - which is permitted under Ofcom rules - whereby if Cameron decides not to turn up, he can be “empty chaired”, which would do the Tories’ election prospects no good at all. So Craig Oliver has seen his brilliant idea go precisely nowhere. What can Dave do now? Er, not a great deal. There is no Prime Ministerial veto. So he’s gone from being chicken to being chicken - and screwed. And his cheerleaders haven’t exactly covered themselves in glory, either. I made the Prime Minister’s final position clear in my last letter – he is willing to do a seven-way debate in the week beginning March 23rd. Clearly it is disappointing that you are not prepared to take him up on that offer. I am ready to discuss at your convenience the logistics of making the debate we have suggested happen. The idea of ITV having a debate next Friday is also laughable because it's Comic Relief night. That any politician would consider turning up and taking attention away from one of the UK's biggest charity nights is barely feasible, even if you think ITV would be willing to torpedo its relationship with the other broadcasters to do it. They could run it as part of Comedy Relief. No, surely not. Unthinkable that Guido should be thought of to replace Dave as leader of an alternative rabble. Having said that he possibly is as credible a substitute filling, sorry, fill in.